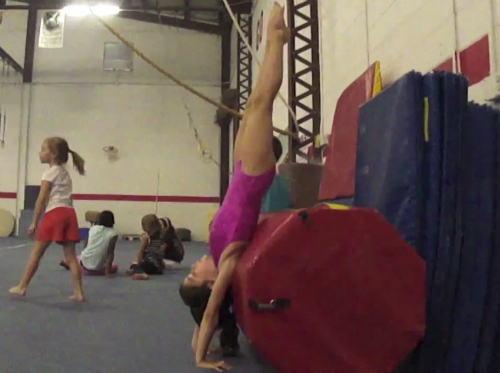 Gymnastics tips from Al Fong and other gymnastics clinicians | Swing Big! So can we talk about how much I LOVE people sharing their new/cool ideas. It actually (and this is going to sound super sappy) warms my heart when I see people in the gymnastics community actively posting videos, information and ideas that they think might help their fellow coaches. Here are a couple videos from channels that routinely post good things to watch. This first video is actually a REALLY neat idea that Al Fong posted. Considering how many short handstands we see, I think it’s a great way to get kids aware of where they are, and keeping their shoulders over the bar. This second drill is a really nice way of introducing front twisting. It enables kids to be on either side depending on which way they twist, it’s safe, it’s fun, and it’s begins the muscle memory process. I think it’s great.